In New York City – and Chicago, Oakland, and Portland, for that matter – obsession with “the best donut in town” is serious business. Bakers arrive at dawn to proof the dough and bake and glaze all through the afternoon. 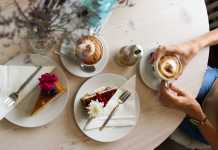 The lines start early, patrons of acclaimed donut shops queued up on what feels like every street corner, ritualizing the morning’s first bite of airy, yeasty, pleasantly rich pastry with strong coffee and light conversation. 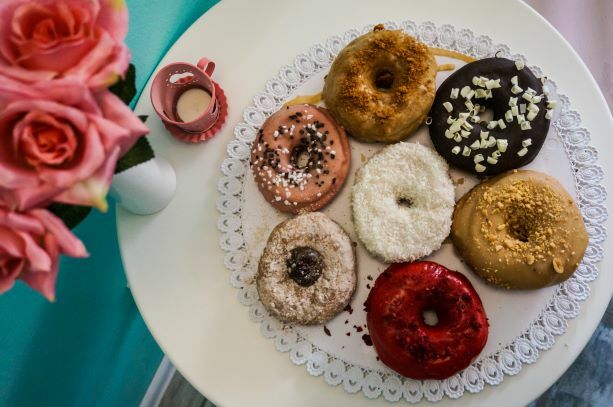 When Peter, the owner of La Donuteria, experienced this during his travels to the U.S., he knew Bratislava was next in line for a city where donuts are serious business. In the summer of 2016 he and his team set out to build the best donut shop on town. We think they have succeeded. The apricot and pastry-cream colored exterior of the Neo-Baroque Krym building is an idyllic spot for an artisan donut shop. 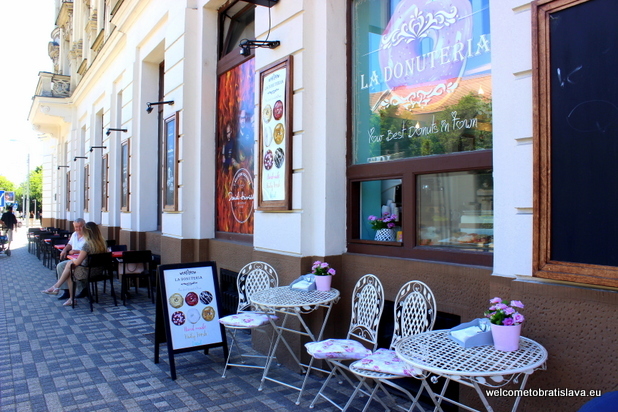 Just across the street from Šafárikovo Square and a short stroll from the center of Old Town (or Eurovea if headed in the opposite direction), La Donuteria is easily accessible by tram, foot, and bike – whether you stay on it or not! Yup, there is a “drive through” window for patrons on the go, perhaps a subtle nod to the donut’s American roots. If you are in Eurovea, you can find their small stand there, too, or – at Patronka, in the office building of Westend Square. 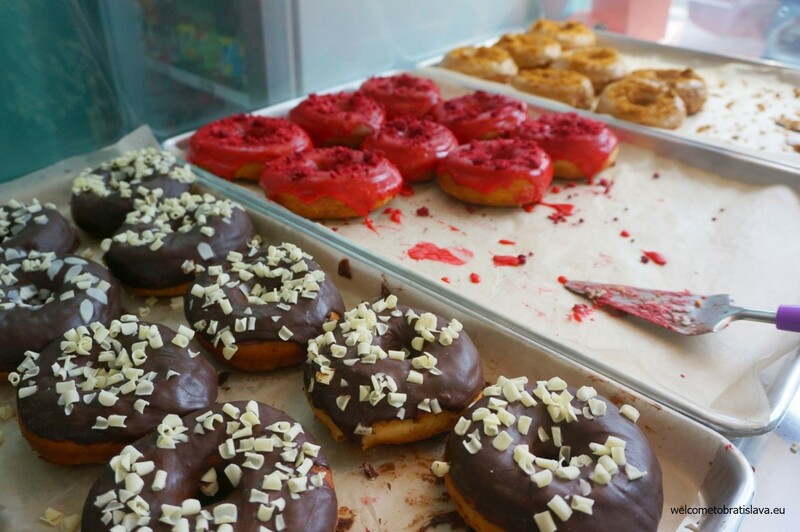 Their donuts can be found also at Avion shopping mall at a partner stand. They also have a retro caravan which “travels” to different events and festivals. 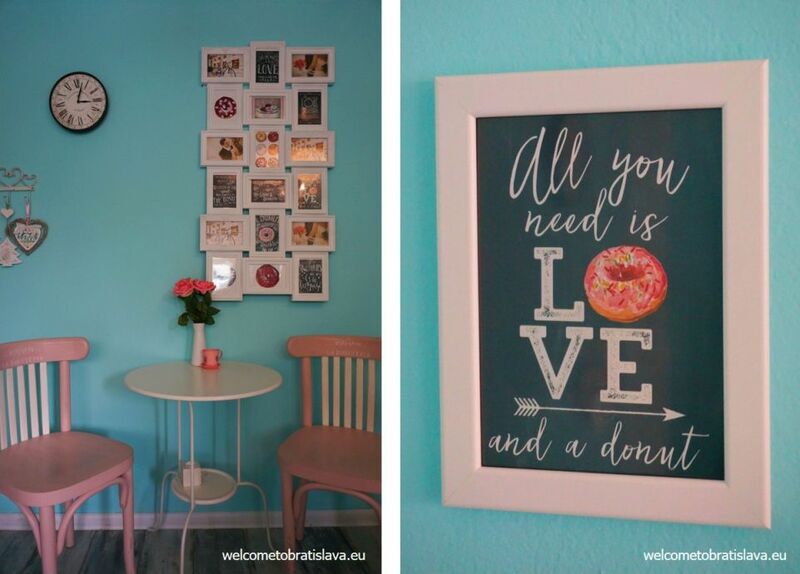 We love the vibe at La Donuteria. The decor, with its cafe-style tables and chairs and hints of natural wood and fresh flowers, was inspired by Peter’s holidays in Provence. 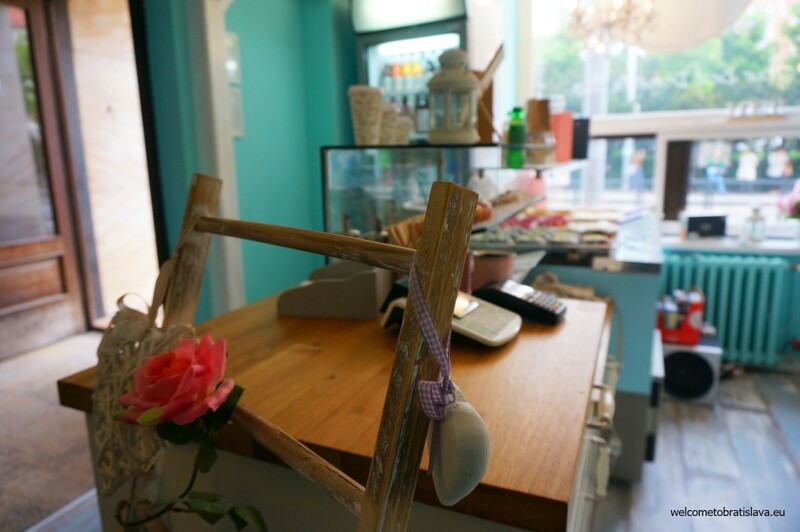 This tranquility is balanced by cheery 1950’s teal walls, soft bubble-gum pink trimming, and the almost neon-raspberry aprons of the team who greet you with smiles when you arrive. 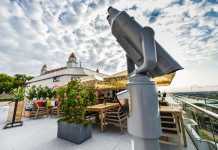 Pleasantly sweet and familiar, the setting is also hip and authentic. Comforting and unique. You guessed it – just like their donuts. 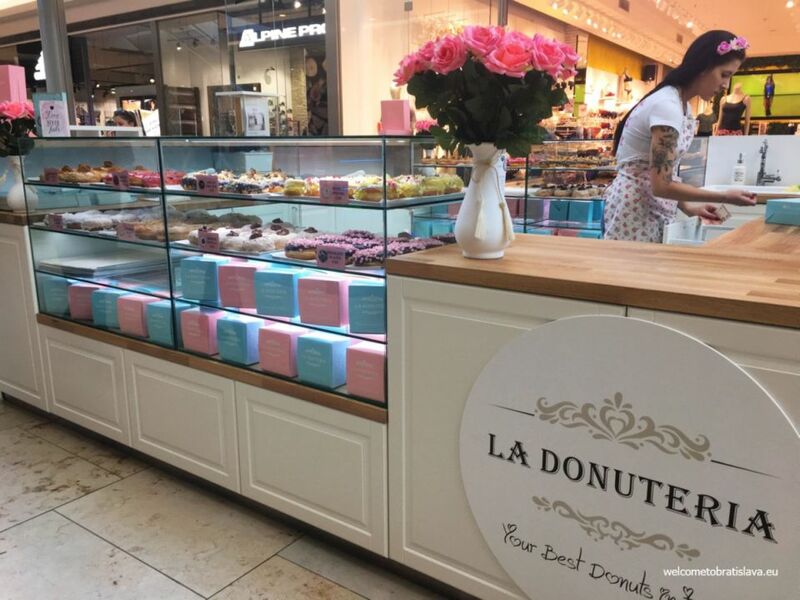 WHAT TO HAVE AT LA DONUTERIA? 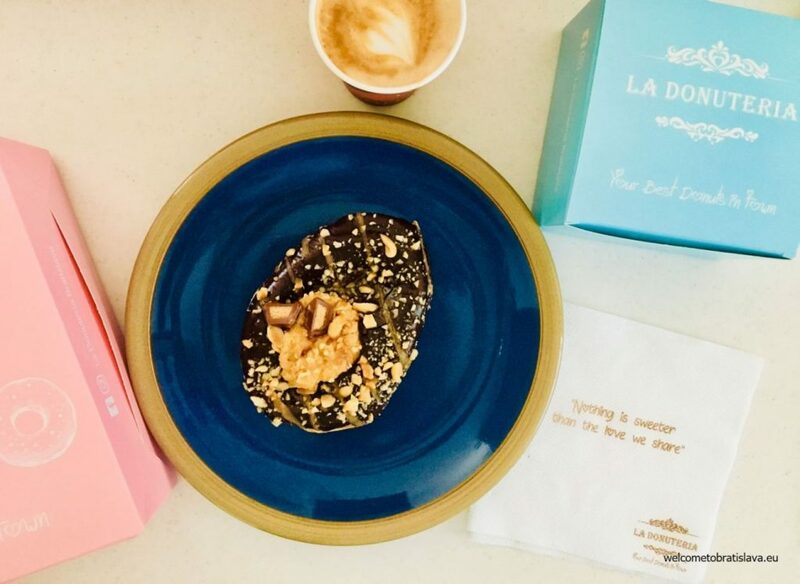 What not to have at La Donuteria? No, really. We are slowly eating our way through the entire menu here, which is no easy task as the offerings rotate weekly and seasonally. In summer we look forward to donuts filled with ice cream! Just like in the famed donut shops across America, the pastry chefs here arrive at 5am to prepare for the day. It took Peter and his team a year to finalize the perfect recipe that used local ingredients (along with a secret ingredient or two). 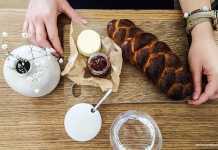 They found the perfect recipe for raised donuts, meaning they are made with yeast and proofed until almost double in size, lending to that soft, airy texture and nutty, almost brioche-like aroma. 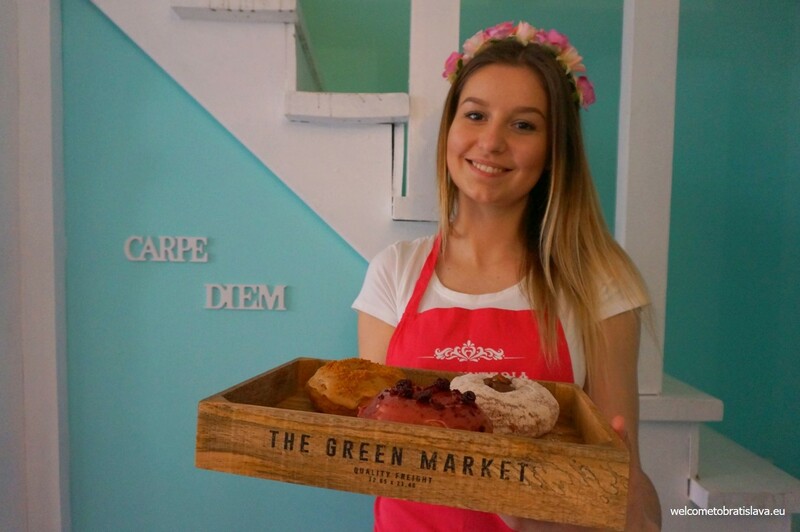 The donuts are baked fresh all day until 2pm and served by a smiling team of ladies. One note, though: When the donuts are gone for the day, they’re gone. Get there early! 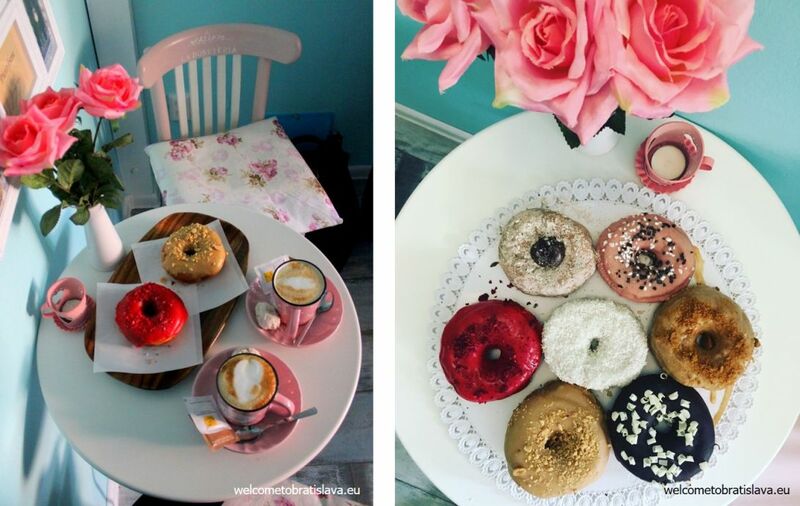 The dough-half of these donuts has just the right amount of sweet and depth – a frostingless donut here could certainly be enjoyed on its own and be worth writing about. The magic is on top, though. Start with the classic Raspberry. Electric pink and dotted with freeze-dried raspberries, visually this is the highlight. The Coconut is more subtle, a slightly less fussy version of a coconut cake. If you miss peanut butter during your visit to Europe – or are a local with a sneaky appetite for the distinctly American spread – people rave about the Peanut Butter flavor. They also offer vegan donuts made with coconut milk! But the keynotes for us here are the Poppyseed & Plum Jam – this is the “Slovak version to try” for sure – and it’s tasty as hell! – and the Dark Chocolate with White Chocolate Shavings. The dark chocolate flavor is intense in a good way. And the white chocolate is buttery and creamy. Not waxy and tasteless like much of the white chocolate we have tried. These all pair nicely with the Lyra Hot Chocolate and expertly made coffee drinks, of course served in perfect polka-dot mugs! 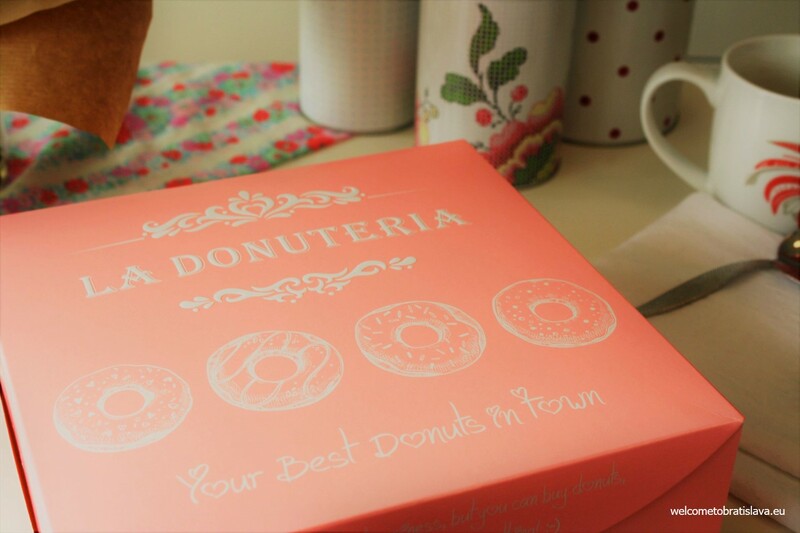 As if La Donuteria could not delight us more, one of the most iconic things here is their packaging. When you order donuts as take-away, you get the prettiest, gift-in-itself box that is almost tempting to keep! We think this beautiful box filled with delicious treats would make a lovely hostess gift or special occasion goodie. We also think a box of these donuts on a lazy weekend afternoon is in our future, and should be in yours, too! I love the descriptive and evocative writing style of this review! 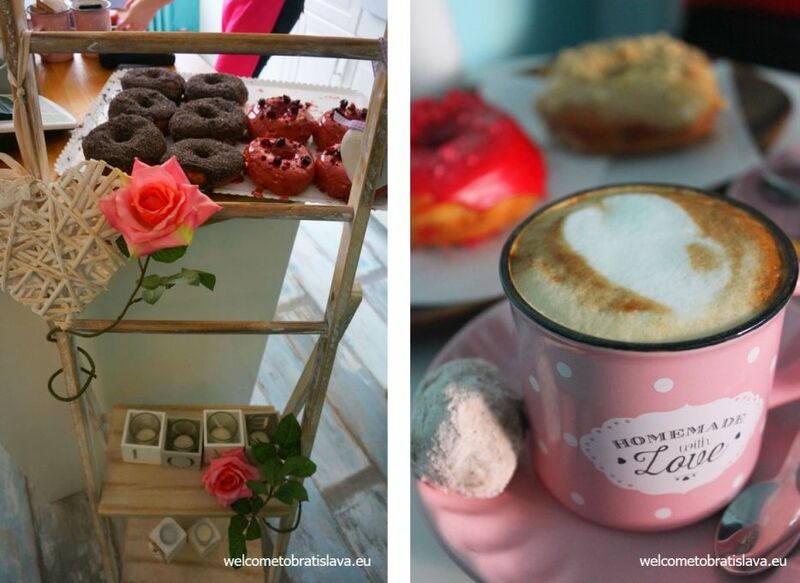 I can almost taste the delicious donuts, which I plan to do when my husband and I visit Bratislava next year!